In today’s tech world whatever may be the device you’re using – computer, laptop, tablet, smartphone etc, speed typing on QWERTY keyboard is a necessity. So, don’t you know your typing speed? Are you still searching for keys when typing? If you say yes, then better late than never, it’s time for you to learn the art of touch typing which involves pressing the right keys speedily and accurately without looking at the keys. There are many ways to learn touch typing easily both online & offline. And even more, there are online typing games which make touch typing fun to practice. Touch typing made easy to learn @TypingClub with a total of 100 practice lesson beginning from individual alphabets, shift-key combinations, numbers, 3 advanced levels and finally symbols. In each of these lessons, as you type the ones you typed correctly are marked with green and those you missed or mistyped are marked in red. And for easy touch typing reference, there’s an image showing which finger to use on the keyboard for each letter to be typed. 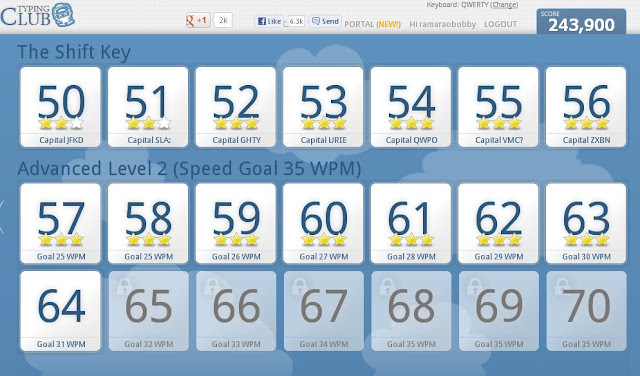 After you’ve done a lesson, your typing speed (in WPM), accuracy and time are given. Also you can find your performance on each characters used in the lesson and respective performance of each of your fingers. Rapid Typing Zone which consists of Typing Tutor, Typing test and Typing games is expanding the facility to learn typing online and offline. For offline usage software tools can be downloaded freely. For this “RapidTyping – Touch Typing Tutor” can be downloaded from the homepage. To teach kids and adults there are beginner, intermediate and expert levels. To know your typing skills, there is link to ‘Online Typing Test’ on the homepage. Enter your name (max. 25 chars), select text matter and click ‘Start Test’ and after completion of test press ‘Done’. Then a report will be generated with your typing results for parameter like WPM (Words Per Minute), CPM (Chars Per Minute) and Accuracy (%). While playing online games, typing can be practiced through Typing Games option. Word Mountain, Fast Typer 2, War of the Words, Typing Arcaniod like this there are top 20 online typing games. And to learn the rules and techniques of touch typing, go to Typing Technique. To learn typing easily and practice typing online, keybr.com is a good platform. Using this web service is free and you need not be a member. In the homepage you will find ‘keyboard outlet’ with visual graphics. With the help of the same, moving the fingers the visible top text matter is to be typed. You can view speed and errors in the top status bar. To record the day-to-day progress and to increase the typing speed you’ve to register and become a member in the service. There is a possibility to login with your Facebook ID details also. And if you need to know typing basics, then “How to Type” tab is available for you. TIPP10, which had already registered more than 2 million downloads is one of the popular free touch typing tutors available for Windows, Mac OS and Linux users. 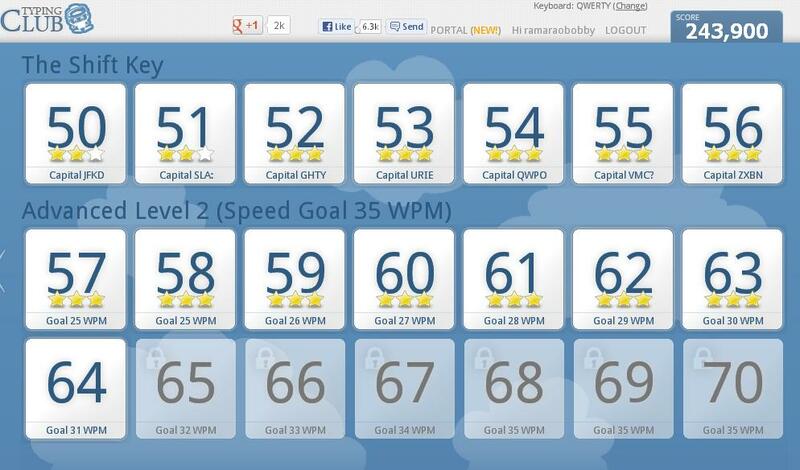 TIPP10 typing software is particularly beneficial for typing practice from basics. The mistakes done repeatedly can be known by ‘Intelligent Tracking System’ and typing speed can be increased. With the help of ‘Fingers Chart’, errors made by each finger can be found in ‘error rate per finger’. There are at least 20 sequential practice lessons that help you become fully acquainted with all the keys on the keyboard. And to make the text visually attractive, you can change the font and text colors. The mistakes done, your typing speed etc details can be generated and a printout can be taken. There are many ways to increase the speed of typing on your mobile and tablet devices. Alterations can be made using various keyboard layouts. If you’re using Android, from ‘Google Play‘ required keyboard apps can be downloaded free of cost. Have you heard about this android app named ‘TouchPal Keyboard’? It is the most innovative and the best alternative keyboard for Android phones which can be installed for free. Using TouchPal, instead of typing word by word, you can do slide in QWERTY keyboard layout. The words to be typed will be inserted by ‘Intelligent next-word prediction’ which saves you up to 80% keystrokes. Because of this technology the typing will be minimal and completed speedily. Other useful feature is sending messages via voice input. By setting word shortcuts you can quickly type longer words or sentences thus increase the typing speed using ‘Perfect Keyboard Free’ android app. Keyboard layouts can be changed as you require and according to your necessity you can select keyboards. Touchscreen keyboard app for Android named ‘SwiftKey 3 Tablet’ is made specially for tablets. As you start typing, it corrects and predicts the words which are about to be typed. Instead of tapping method, typing can be made by sliding. Using ‘Big Buttons Keyboard’ android app you can get BIGGER buttons keyboard layout to type on which makes typing much easier as each key is clearly visible for typing. Read More @Big Buttons Keyboard Standard by Chicago Logic Inc.